From its two centres in Jork and Langförden the ESTEBURG runs an advisory service for approx. 1400 fruit farmers in Northern Germany. Our advisory service begins with a variety re-commendation, one of the most fundamental decisions for the fruit farmer. Once a particular variety has been chosen, problems of its cultivation, crop protection, fertilisation, harvest procedures and storage become important. Business manage-ment and socio-economic questions also need answering. Growers wishing to change from integrated to organic production methods receive detailed guidance over several years. 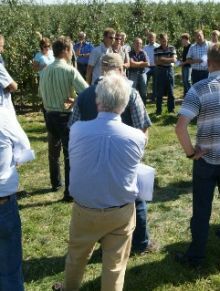 Advice is given throughout the year individually and in many group events, the latter including pre-harvest excursions, winter conferences and some 140 guided plant protection tours of orchards throughout the season. A wide range of advisory service publications are issued each year, including about 80 plant protection circulars by fax or e-mail, our own monthly journal Mitteilungen des OVR des Alten Landes (founded 1947), and the Fruit Grower’s Yearbook, currently in its 79th edition. The Northern German Fruit-Growing Exhi-bition, held annually in February, is a central and very important event for all producers.